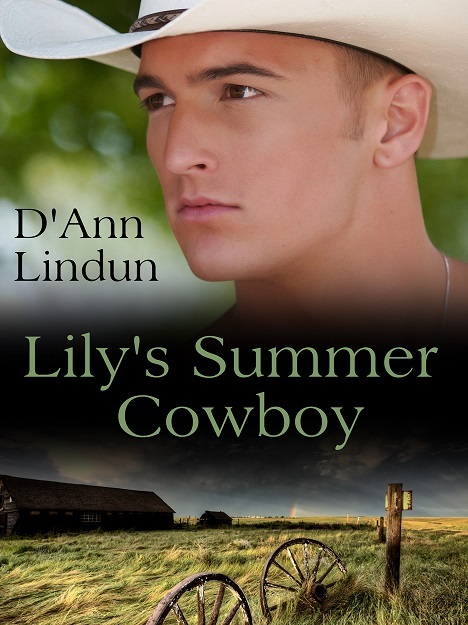 D’Ann Lindun’s – Lilly’s Summer Cowboy! Three days passed and Lily had forgotten all about Maggie’s grandson. Her hours had been filled with getting seed in the ground and nothing else. Her shoulders ached from steering the big John Deere and she still had another five hundred acres to plow by the end of the week. She parked the tractor in the barn and trudged toward the house. The sun had begun to set behind the mountains in the distance, making it hard to see, but she thought someone sat on one of her wicker chairs on the porch. Maybe Maggie’s grandson had come after all. Too tired to do more than eat, shower and fall in bed, she fought a spark of irritation. She didn’t have time to babysit a spoiled teenager. Why Maggie thought she did was beyond her. With a frown, she stepped up on the porch. And stopped. And stared. A man sat on the rocking chair, spinning a Stetson on the toe of one of his boots. A striped western shirt hung open over a grey t-shirt snugged against a flat belly and faded Wranglers pulled over taut thighs. “Nice to meet you.” She took his hand and jolt of awareness went through her. Dark blond hair, eyes as dark brown as the earth. Chiseled cheekbones. Wow. Maggie had led her to believe her grandson was a teenager. This man was no teen. Probably around twenty-five. A man. Although a decade younger than Lily. I love the cover and the thought of a hot cowboy who can heal a heart!